Does anyone actually have the Korner King? 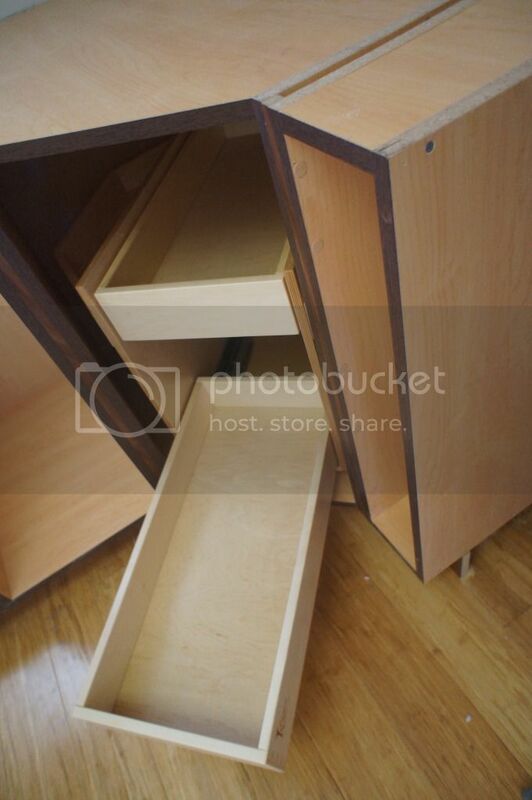 I found it online and have seen it mentioned here in a couple discussions about cabinet corners, but didn't see that anyone had actually gone with it. I've fallen in love with the idea of it, as it seems to offer both the ease of drawers with the storage space of Lazy Susans, but I wanted to check how it worked in practice. I also like that the price is only $299 for the 2-shelf in Maple which is waaaay cheaper than a lot of the corner Rev-A-Shelf solutions and about the same as some wood lazy susans. 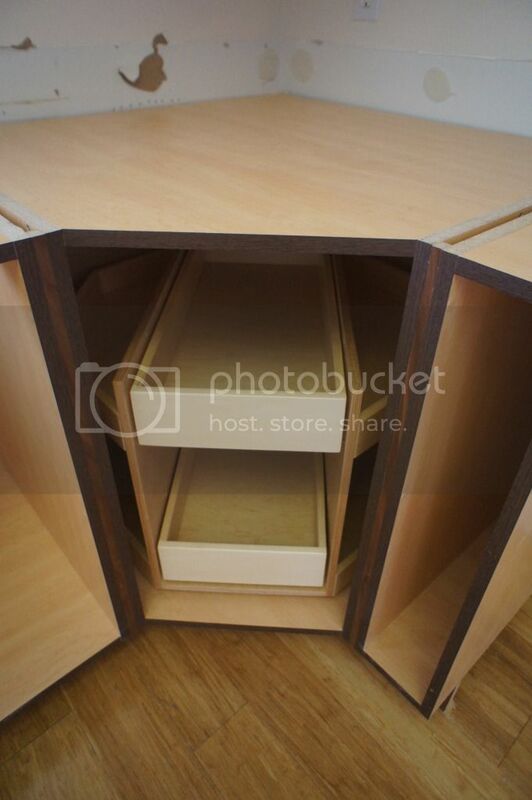 Also, if anyone is familiar with it - looking at the website it seems that because of the size of the drawers your corner cabinet would have to be at least 36", so I would have to change my layout from my possible 33" to a 36" to make work. Has anyone put it in anything smaller? I'm amazed how no cabinet companies seem to give the full dimensions on their corner cabinets, so I'm trying to guess here without having a cabinet to use for reference. (Obviously, I would get my actual dimensions from my cabinet guy before ordering). The drawers are fantastic and I'm happy I didn't pay about $100 more for the 3 drawer model. The spin isn't super smooth, but I'm guessing that there's simply an adjustment that needs to be made or some lubricant that needs adding. Don't get me wrong - it still spins just not as smoothly as some other lazy susans. I'll provide some more feedback once we actually figure out where everything is going to go in the kitchen and I load it up! OntarioMom~ I have a Kornerking and so far I'm quite happy with it (3 shelves + 3 drawers). My cabinet maker did have to make some adjustments to it due to my inset cabinetry. Let me know if you have any questions or want to see any photos. I can't comment on long term use yet, we just moved into our house over the weekend. I also got the retrofit super susans. My husband had to adjust them to get them on my shelves. The issue was again, my inset cabinetry. I've been using the KornerKing since November. No complaints. As I posted far above in the thread, we have the tall 2 drawer unit. I use if for small appliances that I don't want on the counter and oddly sized kitchen tools... so: food processor, rice cooker, hand blender, food mill, mandoline, funnels, box grater, sifter, and my liquid measuring cups. Probably a few other things as well. 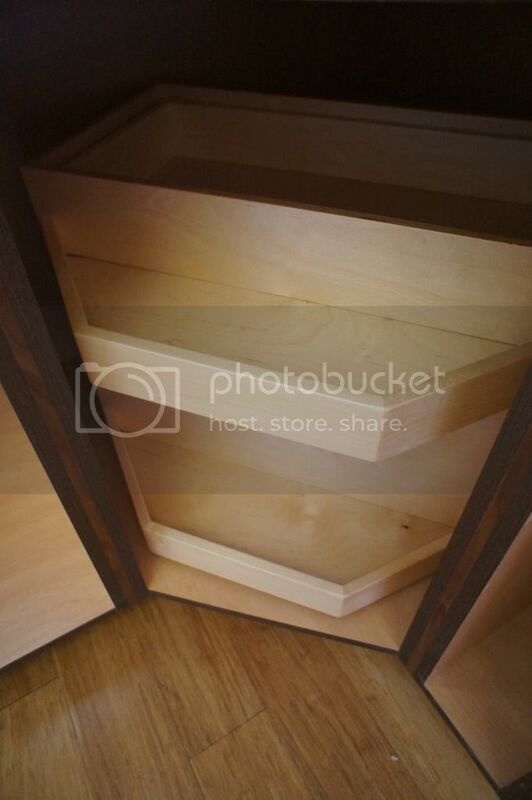 I like that it keeps things separated and organized and the drawers make it much easier to get out the larger items. After spinning, I do have to be careful that it is reset in the correct position for the door to close properly and for the drawers to pull out without hitting interior hinge hardware on the door. So sorry to abandon everyone once my kitchen was complete! Anyway, I am really happy with my Korner King. It spins just fine now that it's full. The only thing I've noticed was mentioned above that occasionally I have to adjust it back into the right position, but since I have the angled, the door will still shut when it's off-kilter. I really don't think that there is a better corner solution out there - at least the bottom one, especially comparing quality and price. If someone gets the top one, I would love feedback. It seemed like it wouldn't be such a great use of space as the bottom. If someone still need measurements on the shelves and drawers, I might be able to check mine. Let me know.